Baby Boy's My First Photo Album of Family and Friends is generous in size! Holds 15 - 4 x 6 photos! Fill baby's first album with all the people who LOVE baby! 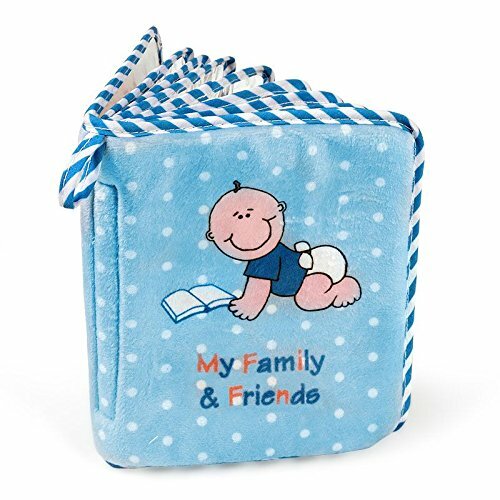 Baby Boy's My First Photo Album of Family & Friends - Infant Development Toy. nfant Development Photo Album - by Genius Baby Toys. Baby's My First Photo Album of Family and Friends. Babies love looking at photos of their family and friends! This bright, contrasting album has wipeable vinyl pages and helps baby's developing visual skills. Generous size, holds 15, 4 x 6 photos of baby's favorite family and friends. Baby's photo album offers plenty of room for pictures of Grandma , Grandpa, Aunts, Uncles, Cousins.. friends, pets and more... Fill baby's first album with all the people who love baby. Includes loop for hanging on stroller crib, car seat, or play pen. Bonus: Baby-safe full page see me mirror on the final page of the album, to surprise and delight baby. Perfect newborn toy and infant stimulation gift idea. Newborn and up Includes complimentary blue striped reusable vinyl carry pouch. Baby blue, ultra soft cotton fleece material. Surface Washable. Genius Babies Inc. Charlotte, N.C. USA.